Peter Gilmour staged an incredible comeback today to book his place in the semi finals of Stena Match Cup Sweden. Gilmour of Yanmar Racing, the World Match Racing Tour’s elder statesman, proved experience is everything as he sent fellow countryman Torvar Mirsky of The Wave, Muscat packing in a fine Quarter Final display. 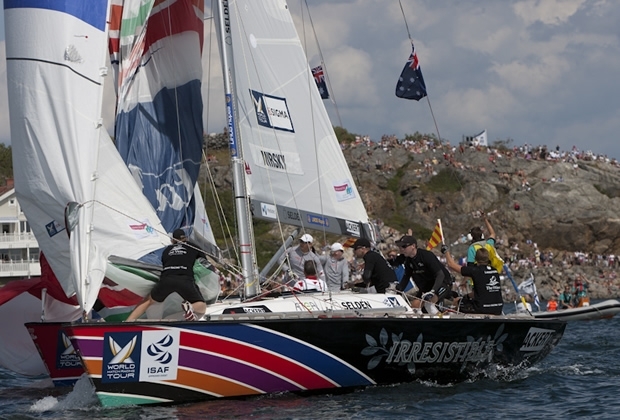 Gilmour turned his fortunes around on the waters of Marstrand Fjord defeating Mirsky, one of the form skippers in qualifying, in three straight wins. Gilmour’s hopes of his first event win of the 2011 season are still alive – but first he must face Portimao Portugal Match Cup winner Ian Williams of Team GAC Pindar in the Semi Finals tomorrow. The pair have met six times so far this season, with Williams winning on every occasion. It will be a Scandinavian scrap in the other Semi Final pairing as Swede Bjorn Hansen, winner of the 2007 Match Cup Sweden, takes on last year’s runner-up Dane Jesper Radich of Adrian Lee & Partners. Four-time match racing world champion Gilmour was below par in the Qualifying Sessions, only just scraping into the Quarter Finals after scoring two crucial wins this morning against World Match Racing Tour leader Francesco Bruni and Swede Johnie Berntsson. At the end of Qualifying Gilmour was caught in a five-way tie for the three remaining places in the Quarter Finals, sneaking in on a countback that saw Berntsson and Australian Keith Swinton sent home. More than 30 years of match racing experience then came into play as Gilmour and his team refocused their efforts and came out firing against Mirsky, swiftly taking his tally to 2-0. With Mirsky on the ropes Gilmour continued to apply the pressure – and it worked to great effect, the young Australian’s temper boiled over at the first mark in response to two successive penalties from the on-the-water umpires. Mirsky was left with no option but to take his penalty turns allowing Gilmour to stretch to an unassailable lead and sail into the Semi Finals. Despite a relatively low win rate – just 45% going into this event – Gilmour continues to win the matches that count. A win for Gilmour would see him overtake Tour leader Francesco Bruni, who failed to make the Quarter Finals in Sweden, in the overall Tour standings. Gilmour said: “We sat down and had a team talk last night. We knew if we sailed well in our last two matches there was a chance we could still make the Quarter Finals. This morning’s wins proved to be crucial and we scraped through into the quarters. Going into the Quarter Finals is a complete restart and if you don’t shift your way of thinking you can really lose your mojo. It’s really important to just start again. I’m quite good at being able to clear my head of everything that has gone before me. Thousands of spectators packed the shoreline to watch Swedish sailing star Hansen defeat Phil Robertson in back-to-back wins. Hansen has been open about his desire to hold a Tour Card – and his performance here in Sweden is doing his campaign no harm. Hansen now faces a Semi Final battle with Jesper Radich, who put on a dominant performance to defeat France's Mathieu Richard 3-1. The Semi Finals will kick off tomorrow morning with the Final taking place in the afternoon.